The 525 km (326 mile) stretch of Highway from Fort Nelson to Watson Lake is surely the most scenic along the Alaska Highway. Travel past clear lakes, rushing rivers, extreme canyons and the northern Rocky Mountains. Numerous unique rock formations, extreme wilderness, wildflowers and wildlife ranging from rare stone ram, black bears, grizzlies, deer, caribou, elk and wolves make this a beautiful journey. 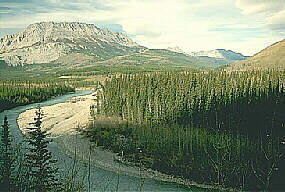 This northern route passes through vegetation from muskeg to hot springs. 27km (17miles ) from Fort Nelson is the junction to Hwy 77 (Liard Highway). You will travel this wilderness gravel road 400 km (248 miles) to the Mackenzie Highway near Fort Simpson. Further along the Alaska Highway, at Mile 351 is Steamboat Mountain which may be accessed via a small north turn road. The view of the Rocky Mountains from this 1,067 m (3,499 miles) summit is spectacular. 15 km (9 miles) further is Indian Head Mountain and Teetering Rock. Tetsa River Provincial Park, with 25 campsites and rustic facilities, is an excellent spot for grayling fishing. Located on either side of the highway for 14 km (9miles) is the scenic Stone Mountain Provincial Park with towering mountain peaks, valleys, alpine tundra, hoodoos, waterfalls and lakes. You may be lucky enough to see some of the stone sheep, mountain caribou, elk, deer and moose resident in the area. Experienced hikers will enjoy wilderness hiking in this rugged terrain. The BC Parks Summit Lake Campground with 28 sites is found just inside the park boundary. Summit Lake is the highest point on the highway at 1295m (4247 feet). Various trails from the camping area lead to Summit Peak and Flower Springs Lake. Near Stone Mountain Park on its southwest boundary is Wokkpash Provincial Recreation Area. Wilderness camping only catering to experienced hikers. Along the highway past the Summit Lake Campground is the One-Fifteen Creek Provincial Recreation Area with short trails to beaver dams and ponds. A good spot for grayling and Dolly Varden is the Racing River Wayside Area, 25km (16miles) from One-Fifteen Creek. At Mile 422 is Toad River with facilities and an airstrip. This 12 km (7 mile) long lake is surrounded by abundant wildlife, mountains and more lakes a beautiful jade-green (copper dioxides) colour. There are over 30 campsites available here if you plan to stay and explore the area awhile. Possible spots include Folded Mountain, Centennial Falls and two more campsites, Strawberry Flats Provincial Campground and MacDonald Provincial Campground.Services and lake tours are available in the community of Muncho Lake. After leaving Muncho Lake and continuing along the Alaska Highway you'll leave the mountains and descend into the Liard River valley (Liard is French for cottonwood tree). At Mile 496 you cross the Liard River and just beyond is Liard River Hot Springs Provincial Park. This area is home to a unique microclimate where over 80 species of plants thrive, most uncommon to the northwestern region. A wooden boardwalk leads across two swamps and their different plantlife. Over 50 campsites are available year-round. 27 km (17 miles) north from Liard Hot Springs is Smith River Falls, a quiet picnic area just off of the Alaska Highway. There is excellent Dolly Varden and grayling fishing in the river. Back on the highway visit the Whirlpool Canyon Viewpoint, Alans Lookout and Contact Creek Lookout. For nearly 65 km (40 miles) the road crosses the BC/Yukon border seven times. Here the Alaska Hwy crosses the 60th parallel and you enter into the Yukon Territory. Watson Lake is 12km (7miles) north of the border. It's famous for the Sign Posts started by US soldier Carl Lindley in 1942. The tradition carries on, with signs and license plates from all over the world, numbering approximately 10,000. The Cassiar Mountains come into view as you continue your trip to Whitehorse and beyond.